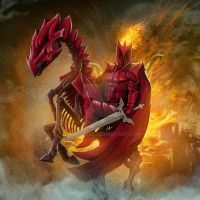 Does anyone know where to get this in hi-res for printing? What are those guys represent ? The antichrist, death, famine, and war. He's in the Bible in the book of Revelations. 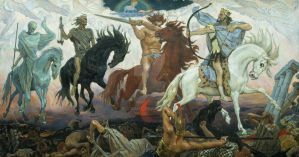 The Bible is where we actually get "The Four Horsemen." At the End of Days, the Antichrist is supposed to be the one to step on the scene and take over the world and he's really, really evil. 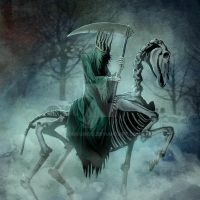 Most people don't include him in "The Four Horsemen" and prefer to use "Pestilence", but in this piece, seeing as how the person sitting on the lead horse is majestic looking and powerful, I'm inclined that the artist intended for them to be the antichrist. Other interpretations view him as Conquest, representing the spread of Christianity. These interpretations do not view him as evil but instead as a force of justice. I think korintic likely meant for him to be that-- korintic's depictions of evil are usually grotesque and very corporeal, this depiction seems to have more of a holy quality to him. That being said, I'm not the artist so I can't speak to his intentions. Yup , Apocalypse , yeah ! And this damned without-eyes-world under their horses . Conquest. War is the one with the fiery head and spears going through his body. 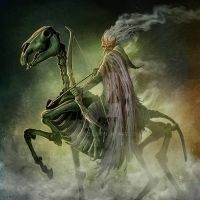 Conquest is biblically the Rider of the White Horse, though in the West he is sometimes replaced with Pestilence, as white was associated with disease. Here is the embodiment of Conquest, symbolizing the subjugation of Humanity. 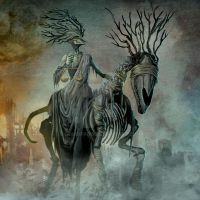 I always interpreted conquest as human greed and lust for power, spreading chaos through the nations, thus bringing forth war, famine, and ultimately pestilence and death that wipe out millions of lives. Oh, cool! Thanks for filling me in! This is oddly cool, yet extremely creepy at the same time. Yeah, when these guys show up, you know full stop it's dooms day. Famine is on the far left, with War next to him; Conquest is in center, with Death being on the far right. Wow! Your vision of those four look really cool! Thanks! If you don't mind me asking how did you come across this piece? It's getting a lot of extra traffic at the moment but I don't know from where. What does each one represent? Wow yes thanks for that! It's Conquest, actually, not Pestilence, at least traditionally. Pestilence is a more modern western creation, derived from white being associated with disease. Looking at the painting, I assume the artist went for the more Biblical account, as the entity looks for more like the pride of a conqueror personified than disease. Excellent artwork. You have great talent. wait I only know one what are the rest?